The Lunar is a sturdy and stylish table football game that is suitable for home use! The Lunar features an attractive silvery grey finish and has solid chrome plated rods. The players have full body detail and are in Black and White teams, lining up in 1-2-5-3 formations. 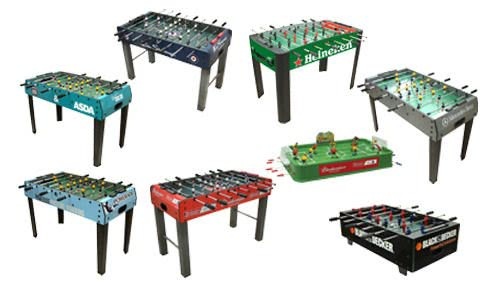 This table is easy to assemble and comes complete with 4 handy cup holders and 2 footballs. The Lunar can be branded with a logo or with colours. Please contact Liberty Games for more information on this option. Delivered by single person courier to ground floor. Terrible table, it comes in individual bits, doesn't fit together as wood has not been cut correctly, screw holes all in wrong place. Absolute disaster DO NOT BUY! This product is delivered by our dedicated 1 man courier service. Delivery is usually within 3 working days. Customers will be contacted with a delivery date and. This service guarantees delivery to the front door. We recommend that there is an able bodied person available to accept goods and take indoors. Free delivery is to UK mainland only. For areas north of Glasgow (AB, DD, FK, IV, KW, KY, PA, PH post codes included) or overseas please contact Liberty Games for a shipping quote before placing your order.